Carol Ann Burlingham, age 77, of Waterford Township, died Saturday, January 12, 2019 at Presque Isle Rehabilitation in Erie after a long illness. She is now together again with her beloved husband Marvin who died less than two months prior. Carol was born November 5, 1941 in Erie, daughter of the late Stephen and Adeline Dollivar Fayak. She and Marvin were married 34 years and made their home in Waterford Township, where she enjoyed her plants, flowers, and especially her dogs. 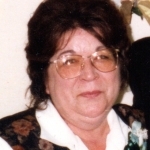 She will be sadly missed by her children: John Karmazion, Debbie Ploss (Pam), Tammy Ormsbee (Tyrone), and Michael Burlingham (Ronald Kuhn); her sister, Janice Tucker (Bob); and several grandchildren and great-grandchildren. The family wants to thank the doctors and nurses of UPMC Hamot and LECOM for their loving care and support. 1 Comment To "Burlingham, Carol Ann"
My thoughts and prayers go out to everyone that knew my Aunt Carol. She was such a sweet, loving person that will be missed by many. She & Marvin can now dance among the clouds.